Discover Africa is a hand-picked selection of Africa’s finest hotels, activities, tours and safaris. The site is running on html5, Less CSS and content management is through ExpressionEngine. Hi, I’m wondering what module did you use for this website. I was looking around and couldn’t find any module as booking system for EE2 expressionengine. Thank you. BTW site looks fantastic! Thanks Hercules, actually we have a custom solution for the booking system. 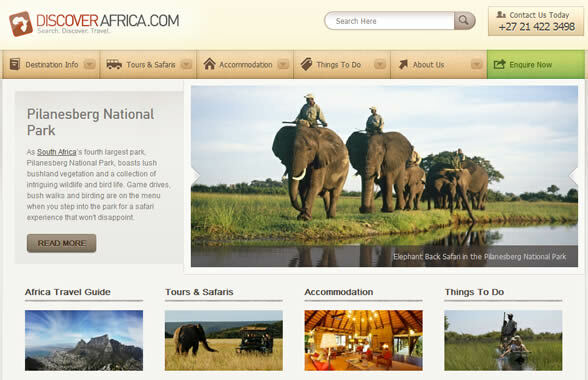 Discover Africa Group are using the TourPlan destination management package. Enquiries are submitted to the TourPlan database and managed by the DAG travel consultants from there. In terms of general enquiry management you can look at Freeform – very basic and not travel specific – or CartThrob for full featured ecommerce functionality. There are a couple other ecommerce modules which also look good, although I haven’t tried them myself. See Ryan Masuga’s excellent http://devot-ee.com for more info on available addons. I’m trying to decide if ExpressionEngine is a suitable CMS for use on a project. I have a lot of experience with WordPress but EE has been suggested as a contender. How did you find using EE?